Spacious double beds for a good nights sleep. Your very own private beach. Sundowners on your private veranda. A stunning view from your bed. Your very own sun bed on your veranda. Green lawns and the blue of the ocean. Relax & rejuvenate your soul. This traditional Swahili style cottage with carved doors and high makuti (coconut thatch) roof is complimented by exclusively handcrafted Swahili furniture with ornate carvings and rich decoration, tasteful decor and rich warm lighting. 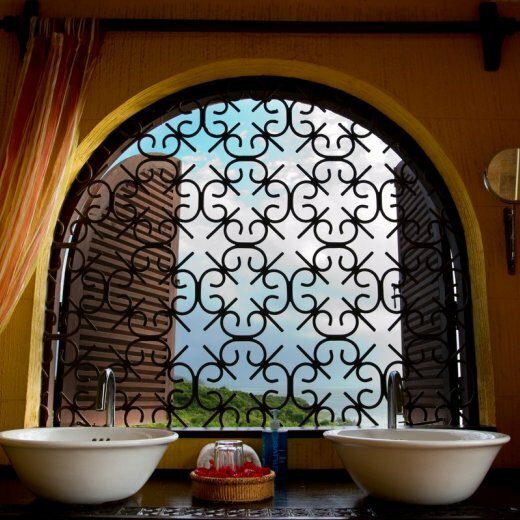 All the authentic Swahili furniture was lovingly restored or specially made for us by the local craftsmen. The rooms have large decks where guests can choose to bask in the sun in an open area or keep cool under a huge makuti roof, refreshed by the gentle caress of the ever present monsoon breezes. As the sun sets, painting a fiery red and amber sky, guests can enjoy a sun-downer while they await the spectacular full moon or clear sparkling stars to emerge as Africa bids a very good night. Each cottage is very spacious with a large private deck which one can step on to from both the room and the bathroom. The en-suite bathrooms have double wash basins, double showers and uninterrupted views of the Indian Ocean from wherever you are. All guests will enjoy their privacy and spectacular panoramas from their own private deck in a truly luxurious, intimate accommodation on a beautiful Kenya coast. A small exclusive private retreat which is home away from home. It is undoubtedly a true reflection of what the word “Tijara” means in one of the Asian dialects – “a place of happiness”. The idea of such a small exclusive private retreat was inspired by our own preferences and likes – we have always tried to avoid commercial destinations in favour of something small and unique. An absolutely stunning little boutique hotel located on it own private beach and surrounded by acres of beautifully manicured gardens. Wake up to the rising sun and lie in your beautiful bed looking out over the ocean. After your morning cup of tea take a stroll down the beach before breakfast for a refreshing dip. Once you are feeling revitalized and reinvigorated head back up to the dining room for a delicious English breakfast. While you are having breakfast Ian, or Larissa will come to discuss your personal menu for the day. Tijara offers luxury intimate accommodation with only 4 exceptional cottages which are situated a good distance apart to ensure full privacy. Each cottage is beautifully sited on its own cliff head with large open decks commanding stunning Indian Ocean seascapes and complemented by Tijara's very attractive gardens. The cottages are refreshed by the cooling monsoon breezes that blow gently off the Indian Ocean all year round, and if it is a little too warm one can make use of the fan conveniently placed directly above the bed. All cottages overlook our beautiful grounds and have full views of the vast expanses of the azure Indian Ocean and beyond. The beach's fresh water swimming pool offers a great way to refresh or you can simply laze on your sun-bed listening to the roar of the ocean, reading your book while sipping on a cocktail prepared to your taste! If you want to spend a day at the pool and feel lazy, all your meals can be taken under the beautiful shady flamboyant tree which will hide you from the midday sun.